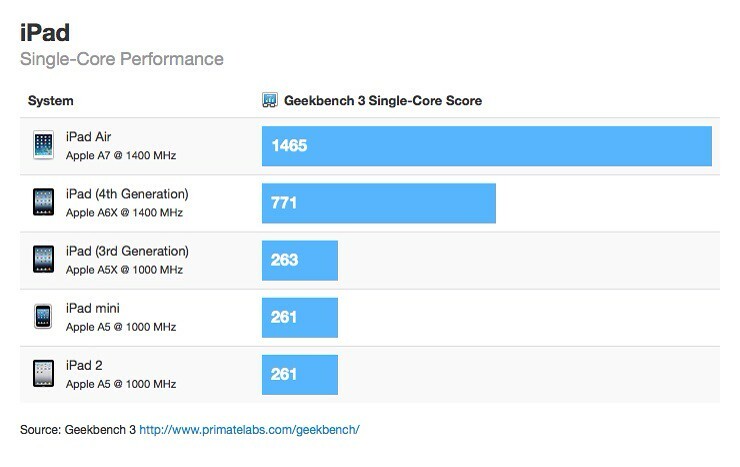 Primate Labs has posted Geekbench scores for the new iPad Air. The device far outscores the previous generation iPad, nearly doubling its score for both single-core and multi-core performance. ● The iPad Air's A7 processor is running at 1.4 GHz, 100 MHz faster than the iPhone 5s' A7 processor. It's not clear if the iPad Air processor runs at a higher speed thanks to a larger battery (providing more power), a larger chassis (providing better cooling), or some combination of the two. I expect the new iPad mini's A7 processor will run at 1.4 GHz as well. ● The iPad Air is over 80% faster than the iPad (4th Generation), close to the 2x increase promised by Apple. ● The iPad Air is over 5x faster than the iPad 2, yet is only $100 more expensive. I do not understand why Apple kept the iPad 2 around, especially at a $399 price point. What market are they targeting? Poole notes that the iPad Air is a great upgrade from the iPad 4 from a performance standpoint. The device is launch on November 1st in numerous countries. More details on that can be found here.